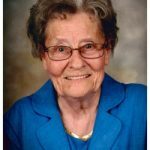 Marian J. Groeneweg, 91, of Rock Valley, Iowa, passed away Friday, Sept. 14, 2018, at Hegg Health Center, Rock Valley. Funeral service was Tuesday, Sept. 18, at Porter Funeral Home, Rock Valley, with interment in Valley View Cemetery, Rock Valley. Marian Joan De Jongh was born Sept. 22, 1926, in Hull, Iowa, the daughter of Henry and Nellie (Van Surksum) De Jongh. On Feb. 19, 1947, she married John Groeneweg. The couple farmed northeast of Rock Valley. They moved into town in 1982 and, in 2013, they moved to Pleasant Acres Care Center in Hull. Her husband passed away May 3, 2017. She made her home at Whispering Heights in Rock Valley. Survivors include her children, Bernard “Bernie” (June) Groeneweg, Harlan (Betty) Groeneweg and Nelva (Art) Den Boer, all of Rock Valley, and Lila (Ron) Schreiner of Sioux Center, Iowa; 15 grandchildren; 27 great-grandchildren; brother, Vern (Hester) De Jongh of Hull, and three sisters, Henrietta (Art) Boeve of Hills, Minnesota, Bev (Dave) Wesselink of Newton, Iowa, and Diane (Harlyn) Kempema of Rock Valley. She was preceded in death by her parents; husband; daughter, Marlys Groeneweg; granddaughter and two sisters and their husbands, Norma (Leonard) Risseeuw and Verla (Harold) Ten Haken.